Everyone knows how the ‘world of flying’ has brought about enormous and profound changes affecting almost every person on the planet. As one beneficiary of these changes, I’m solidly enthusiastic about flying, its technology and the technical skill called piloting. of flying. The quote above from my dad hints at what this is. From the earliest days—and extending to the present—aviation has exerted a tremendous hold on its practitioners: designers, builders, pilots etc. There is a fascination, both intellectual and emotional, which captures an individual, often for a lifetime. My father is a prima facie example of this total involvement. How I would have loved to talk long hours with him about his passion, to gain more insight into what captivated him and his flying generation, and to experience vicariously his exciting adventures. But it was not to be; he was lost just before I turned three. So how do we, in the present, experience something of that ‘glorious dawn’? The pioneers are gone and what few airplanes are left sit silently in museums. As always, when we yearn to recapture something of the spirit of the past, our best resource is a good book by a skilful author. When Peter sent me a copy of his manuscript, I read it avidly, hoping that it would turn out to be just such a book. I was not disappointed! For that reason, if you are intrigued even slightly with the ‘world of flying’, I recommend it for your insight and enjoyment. n March 2007 I was asked to have a cup of coffee with a couple of blokes who wanted to make a documentary about Charles Kingsford Smith. They had a few extraordinary revelations they felt they could make in the doco—were gung-ho on the whole subject—and wondered if I was interested in writing a book on the aviator that might come out at roughly the same time. The idea grew on me. For me and most Australians of my age and older, Sir Charles Kingsford Smith was an iconic figure, although that was mostly through his long-time appearance on our $20 bill and the fact that Sydney airport was named after him. Too, I dimly remember my parents and grandfather speaking reverentially about him. he? What was the legend actually built on? After some preliminary research, the best of all possible things happened to me. I—as we writers say in the trade—got into it and was consumed by the wonder of the story. ; and many other biographies dating back to the 1930s. I did indeed find Kingsford Smith a fascinating man the more I found out about him and yet, apart from the wonders of Smithy’s own life, I also became intrigued—my wife would say obsessed—by other aviation people of those early times. I found I loved the stories of Lawrence Hargrave, the Wright brothers, Lord Northcliffe, Louis Blériot, Harry Hawker, Anthony Fokker, Roland Garros, Charles Nungesser, the Red Baron, Sir Ross Smith, Lawrence of Arabia, Bert Hinkler, George Wilkins and Charles Lindbergh among many more. They were all, of course, august names—at least in their own time—but even in such exalted company, Kingsford Smith could more than hold his own. I was fascinated to find, in the course of my research, that no-one less than Charles Lindbergh himself had dipped his lid to Kingsford Smith personally, saying that what Lindbergh had done in crossing the Atlantic could not be compared to Kingsford Smith’s feat with the Pacific. , the 1934 Centenary Air Race, the story of P.G.Taylor’s wing-walking in 1935, I was stunned both by what wonderful sagas they were and by how little those stories were known by the wider public outside the aviation community, which certainly included me. and of the other extraordinary figures who occupied those times. I have never enjoyed working on a book so much, from finding out more and more about these figures long gone, to travelling all over the world in pursuit of their tales. All through San Francisco, New York, Washington, London, Paris, Calais, Wellington, Christchurch and, of course, all around Australia, I traipsed through museums, over abandoned airfields, into old hotels, and regularly buried myself under piles of dusty newspaper cuttings and old letters, trying to get the feel for the times that were and the place that Kingsford Smith and those magnificent men had in them. The Ballad of Les Darcy. , allow me to say, it was not easy. I have never worked on a subject with such an extraordinary amount of technical detail, nor with such a vast body of archival material to trawl through. Nor, might I add, have I ever worked on a story where accounts of the same episode have been so different, sometimes from the same writer who was there at the time! when it found itself in trouble over Albury. 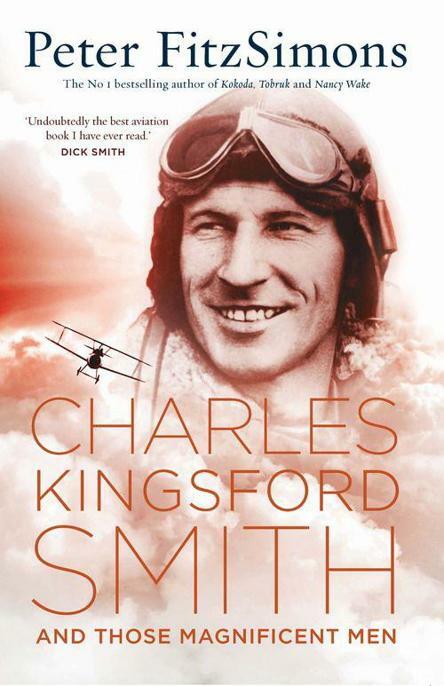 The remaining family of Sir Charles Kingsford Smith were good to me, led by Sir Charles’s only son, Charles Kingsford-Smith Jnr, and I warmly thank him—including for his fine foreword. Early in the writing of this book, I had lunch with John Ulm, the only son of Charles Ulm, and I thank him equally for the help he gave me thereafter. Soon after I started the project I was blessed to find exactly the person I needed: an aviation researcher with knowledge as deep as it was wide, powered by a passion that would kill a brown dog. His name is Peter Finlay, and he proved to be a godsend in terms of ferreting out fresh detail and endlessly tapping old detail on the head with a hammer to see if it sounded tinny or not. And while, of course, all mistakes that remain are my own, I cannot thank him enough for his work and dedication to the cause.